are known for their acrobatics, mischievousness, and passion. They are loyal and intelligent, and bond quickly with their owners. of their owners, they can be easily spoiled. Their voices are softer, quieter and gentler than the larger parrots. Common colors are: green, gray, orange and yellow. however their voices can be very shrill at times. 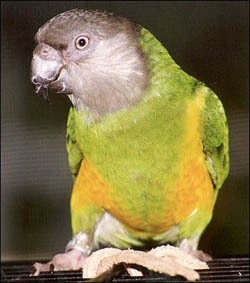 Senegal Parrots can be kept as a single pet. Senegals are monomorphic, meaning males and females look the same. Other than lab testing, there is no real way to tell the difference. Keep cages away from drafts, open windows and the kitchen. cage at night to prevent drafts. to help keep a Senegals feet healthy. carrots. Offer daily or every 2-3 days. Provide a cuttle bone or mineral block. Senegals should always have access to clean, fresh water.